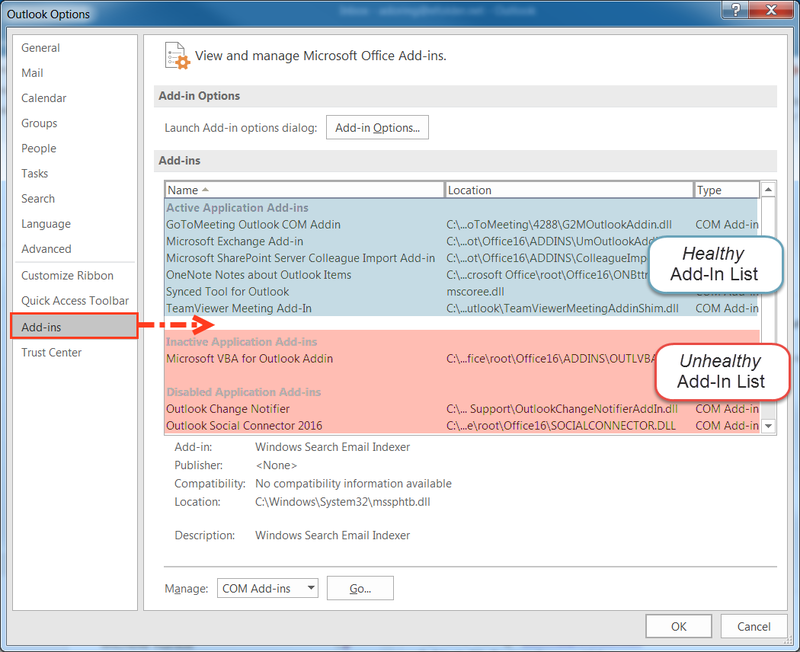 The Outlook add-in is designed to display in the Home tab of the MS Outlook application. Additionally, when you create a new email message, you will also see an Attach button in the Message tab. In some instances, however, the Outlook add-in might not appear as expected. Ensure that the Outlook add-in is supported by your local environment. For information on system requirements, please reference the What are the Anchor System Requirements Knowledgebase article. If your local environment meets all system requirements, you can attempt to restart your MS Outlook application. In MS Outlook, click the File tab, and then select Options. The Outlook Options dialog box displays. Click the Add-ins link. The Add-ins section displays, listing all add-ins according to their status: Active, Inactive, or Disabled. To manage this list, click the Manage drop-down menu, select COM Add-Ins, and then click the Go button. The COM Add-Ins dialog box displays. In the COM Add-Ins dialog box, select the Synced Tool for Outlook checkbox, and review the Load Behavior field at the bottom of the dialog box. If the Load Behavior field is listed as Load at Startup, the add-in should load properly when starting Outlook. Restart the application and test to ensure that the Outlook add-in loads as expected. If the Load Behavior field is listed as, Not Loaded, the add-in will not load properly. This setting allows Outlook to display the actual error it receives when attempting to load the add-in, which supports the troubleshooting process. 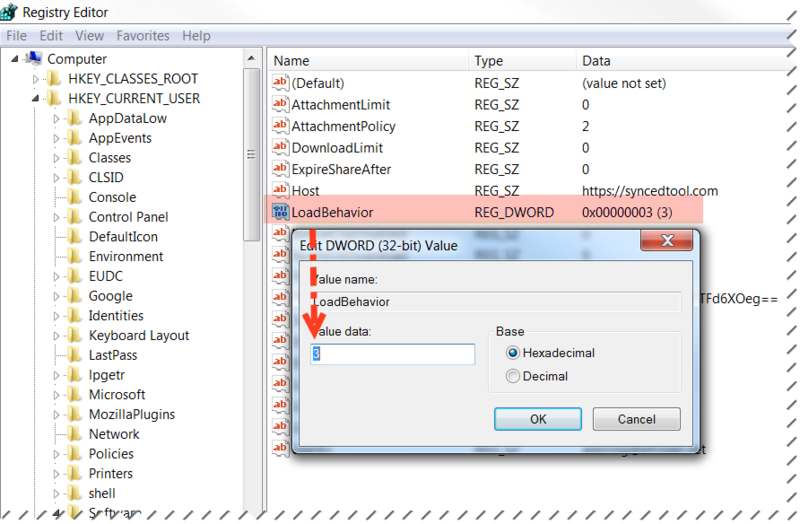 Find the LoadBehavior registry string and set the value to 3 to indicate that it should load at startup. Note: Please proceed with caution and create a backup of your registry before making changes. Editing registry entries is not supported. In some instances, certain registry entries will need read or write permissions for the Outlook add-in to load properly. 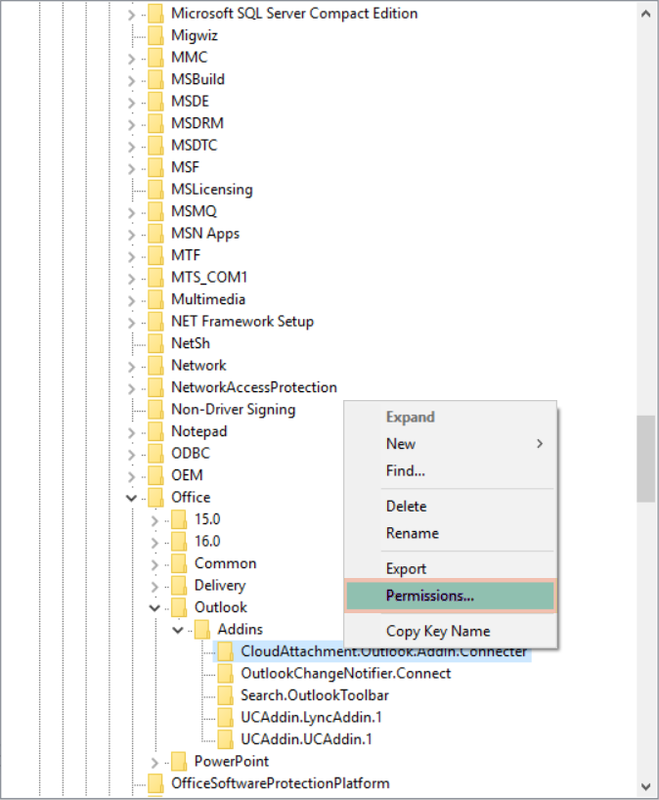 Note: If you do not see these registry entries, then the Outlook add-in did not install correctly, or a group policy is blocking the creation of these registry entries. Right click the node and select Permissions. In the Permissions dialog box, ensure that the user has read permissions. Click the OK button to save any changes. Note: If you do not see this registry entry, then the Outlook add-in did not install correctly, or a group policy is blocking the creation of these registry entries. 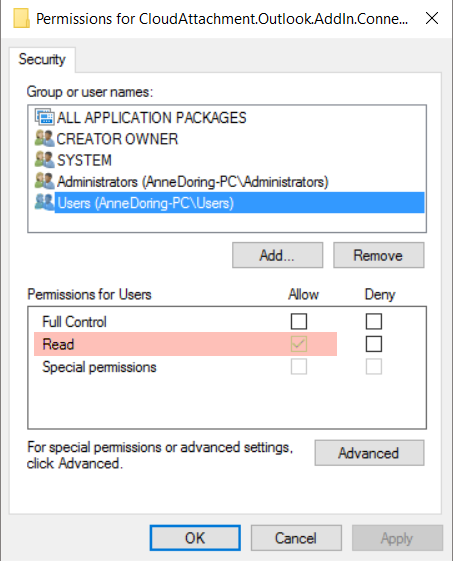 In the Permissions dialog box, ensure that the user has write permissions. In some instances, MS Outlook might deactivate the Outlook add-in. For example, if an add-in that utilizes the same DLL (mscoree.dll) has been previously disabled, the Outlook add-in will also be listed as disabled. In the Manage drop-down menu, select Disabled Items and then click the Go button. The Disabled Items dialog box displays, listing all disabled add-ins. Select mscoree.dll from the list of disabled items, and click Enable. Confirm that the Outlook add-in is not listed under this registry key. If you are still experiencing this issue, please uninstall the Outlook add-in, and then reinstall the latest version. For installation instructions, please reference the How to Configure and Use the Outlook Add-In Knowledgebase article.